The first EC250 EMU was unveiled at InnoTrans in September 2016. Photo: courtesy of ubahnverleih via Wikipedia. Stadler EC250 high-speed train is based on the FLIRT EMU. Photo: courtesy of ubahnverleih via Wikipedia. Stadler EC250 has a maximum operational speed of 250km/h. Photo: courtesy of ubahnverleih via Wikipedia. The EC250 offers seating for 405 passengers. Photo: courtesy of ubahnverleih via Wikipedia. 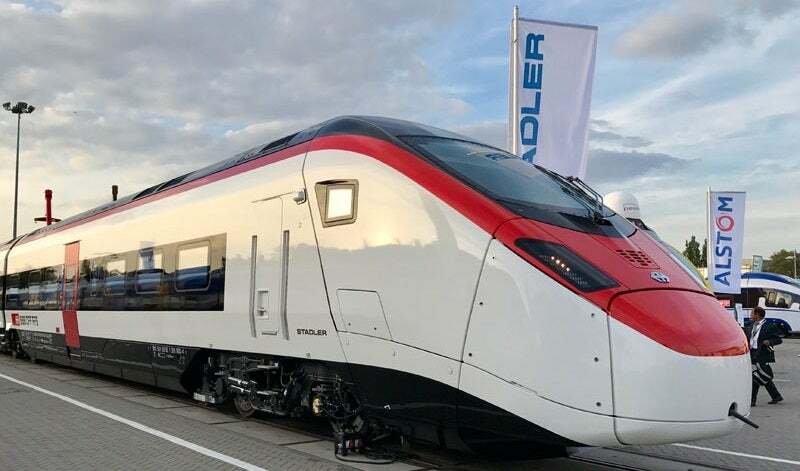 The EC250 high-speed electric multiple unit (EMU) developed by Stadler Rail Group, a company based in Switzerland, is the world’s first single-decker, low-floor high-speed EMU. In October 2014, Stadler received a contract from Swiss Federal Railways (SBB) for the delivery of 29 high-speed EC250 EMUs. The contract also includes an option for additional 92 units. The first EC250 high-speed train was launched at InnoTrans in Berlin, Germany, in September 2016. The new trains are approved for operation in Switzerland, Germany, Austria and Italy. "The first EC250 high-speed train was launched at InnoTrans in Berlin, Germany, in September 2016." The high-speed train, named ‘Giruno’ by SBB, will operate on the line connecting Basel/Zürich with Milan through the Gotthard Base Tunnel. The first train-set will be handed over to SBB in May 2017, while commercial operations are scheduled to begin by the end of 2019. Based on the design of the highly successful FLIRT EMU, the Stadler EC250 features a pressure-tight design with superior thermal and sound insulation characteristics. The train-sets are designed to cater to long distance rail transport. The EC250 complies with the TSI-High-speed regulations and meets the EN 15227 crashworthiness standards. It us designed with special emphasis on comfort and customer convenience for families, senior citizens and disabled passengers. The low-floor entrance area further makes boarding for passengers convenient. The cars offer step-free access from platforms with heights between 550mm and 760mm. The standard-gauge EMUs measure 202m-long, 2.9m-wide and 4.25m-high, and have an empty weight of 380t. The wheelbase of the bogies is 2.7m, whreas the wheelbase of the motorised bogies is 2.75m. The flexible interior design allows for modifications according to the requirements of the operators, while the components can be easily maintained to achieve cost-efficient operation. The cars offer spacious and bright interiors equipped with a state-of-the art lighting system. The EC250 is equipped with comfort features such as 4G/3G cell phone signal booster, power sockets for all seats, and large overhead luggage racks. The vehicle offers seating for 405 passengers, including 117 in the first class and 288 in the second class. The EC250 features multi-functional and bicycle storage areas. Wheelchair spaces and wheelchair-accessible water closets can be found in the first and second car classes. The gender-separated toilets, including unisex, reserved for ladies and urinal toilets are found in cabins. The roof of the train is mounted with four electric current collectors, which transmit the required power to four motorised bogies. The bogies further transfer the power to the track via wheel-sets. The motorised bogies generate a maximum power output of 6,000kW, ensuring a maximum operational speed of 250km/h. The EC250 EMUs are equipped with the advanced traction technology from ABB, which ensures a smooth start, quick acceleration and efficient energy regeneration during braking. The train-sets can also run in double-traction. The electrification systems fitted to the trains are compatible with the Swiss and German 15kV 16.7Hz power supply, and Italian 3kV direct current (DC) and 25kV 50Hz electrification systems. SAG Alutech, a company of the Salzburger Aluminium Group, is Europe's leading supplier of aluminium fuel tanks and air pressure tanks for heavy trucks and special markets. Its Euromotive business unit provides development and manufacturing of complete lightweight window systems for the railway industry.